I have another fun project I completed at my scrapbook retreat. This time I was working on a shadow box. I try to make something for my teaching partner every year when we start school. Last year I made her a shirt with HTV and the year before it was word blocks for the classroom. This year I created a shadow box (one for me too!) that can be used in the classroom. I picked out a nice background paper and used a box of crayons to fill the box. The front of the shadow box is finished with a vinyl quote I downloaded from Lori Whitlock. 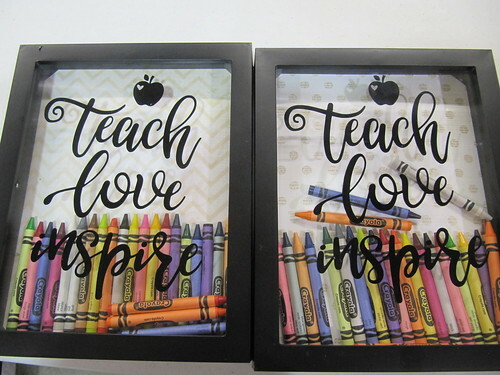 I think my teaching buddy will love it but I can't decide if I want to keep the chevron or dot background!